Meeting librarian and writer and blogger friends from the Internet in real life–you get to hug them in real life!–and seeing lovely librarian and writer friends from the Boston area. Having writer friends in from out of town meant an awesome panel at Brookline Booksmith, one of my favorite places to both meet readers and buy books. Awesome questions, thoughtful/hilarious discussion, fantastic audience. Saying hi and the Candlewick booth and snagging an ARC of A Tyranny of Petticoats: 15 Stories of Belles, Bank Robbers & Other Badass Girls. Listening to thoughtful discussions at the We Need Diverse Books panel and the Class of 2K16 Debuts panel. Seeing ARCs for friends books and getting excited about all the future readers who will love these books. Sharing Thin Mints with friends old and new. Talking about reading, writing, publishing, teen readers, feminism, graphic novels and more with people who get it. This is the kind of weekend that reminds me why I love being part of the book community. People are so enthusiastic and smart and talented and kind and thoughtful and funny. They’re pushing the boundaries in all sorts of fields and making a difference for readers everywhere. I cheered along with the webcast of the ALA Youth Media Awards this morning, and was so proud to be part of this larger community. Thanks to all who helped make this such a fun and inspiring weekend. Here’s to another awesome year of our bookish community! Real Teen Lives Panel This Friday! YA authors who are keeping it real–Marieke Nijkamp, Laurie Elizabeth Flynn, Emily Martin, Jen Malone, and I talk about crafting real stories for teen readers. Also book signing and hilarity. Come say hi and chat with us about writing, books, and being real. Looking forward to an awesome start to a bookish weekend! Real Teen Lives YA Panel – January 8! YA authors who are keeping it real. Come see Marieke Nijkamp, Laurie Elizabeth Flynn, Emily Martin, Jen Malone, and me, as we talk about crafting real stories for teen readers. Librarians in town for ALA, please join us and share some high fives for contemp goodness! This is just the kind of reading I needed for a Thursday morning. Niño recently won a Pura Belpré (Illustrator) Award, and I was excited to get to hear/see this dynamic book. So cute and fun! Click through for more info on Niño and Morales (who’s also a puppet maker? how cool!) at Latin@s in Kidlit. Congratulations to all the award winner and honorees, especially the team at Candlewick Press. Love you guys! A little reading this morning, followed by brunch (you need coffee and biscuits for a book challenge, right? ), followed by more reading. I managed to finish the second of the books I was in the middle of. Onto the stats! 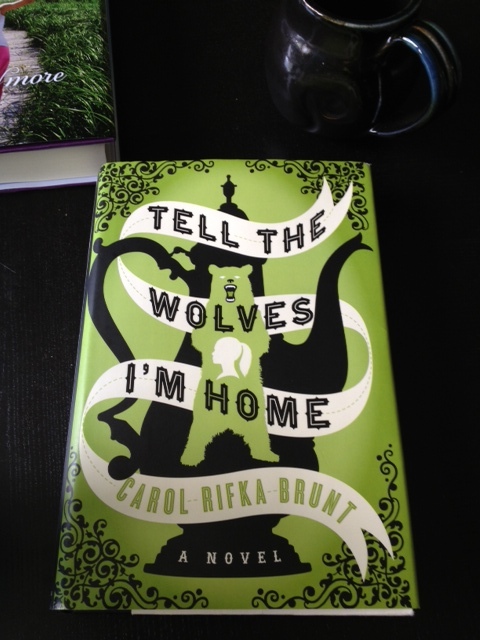 Review #2: I had already been about two-thirds of the way through Tell the Wolves I’m Home when I picked it up again for #48HBC. It was one of this year’s Alex Award winners, and I can see why–June’s a rich and compelling narrator, who’s navigating adulthood in the middle of losing her favorite person in the world, her uncle Finn. I remember feeling a lot like June at that age, as she feels like part of her is slipping away when she has a harder time pretending she’s in the middle ages. I was also really impressed by the character of Greta, her sister, whom I expected to just be the kind of obnoxious, wordly older sister. Instead, Greta is a complex character who desperately wants to connect with her younger sister and doesn’t quite know how. Overall, an excellent look at love and grief and jealousy and reconciliation. It’s beautifully written and quiet, which is the kind of book I’m drawn toward. Make sure to check out the rest of Candlewick’s We Believe in Picture Books campaign, too. And congratulations to John Klassen! In case you weren’t at ALA or didn’t catch the livestream today, here’s the ALA Youth Media Award list for 2013–aka, your list of books you already love or books that are immediately going on your to-read list. I was especially excited to hear that that the Laura Ingalls Wilder Award went to Katherine Paterson and the Margaret A. Edwards Award went to Tamora Pierce. They’ve done so much for generations of young readers and totally deserve these major awards. Books that are immediately going on my library loan request list: Bomb: The Race to Build—and Steal—the World’s Most Dangerous Weapon by Steve Sheinkin, The One and Only Ivan by Katherine Applegate, and Code Name Verity by Elizabeth Wein (I KNOW, I KNOW). Share your post-ALAYMA thoughts in the comments. I’ve always been interested to see who’s nominated for these awards, but now that I’m becoming part of the YA/children’s lit community, I’m also really excited about the possibility of actually knowing people whose books could be selected. Less likely for 2012, but I know a few 2013 authors and lots of great 2014 authors. Even though obviously the ALA awards can’t recognize every awesome book, I’m still psyched by the possibility of actually knowing an award-winner. With the Morris Award finalists announced, two of my favorite YA blogs–Stacked and A Chair, a Fireplace, & a Tea Cozy--are tackling what it means to be a debut novelist. First the basics: “The William C. Morris YA Debut Award, first awarded in 2009, honors a debut book published by a first-time author writing for teens and celebrating impressive new voices in young adult literature.” I love the idea of this, and I think it’s a great way for first-time authors to get recognition. At Stacked, Kelly lists the rules that apply to the Morris Award. The problem mostly comes in with Seraphina by Rachel Hartman, as Hartman had previously self-published a graphic novel about the fantasy world used in Seraphina. Does that count as a previously published work and disqualify Hartman? The Morris committee doesn’t seem to think so, and Kelly and Liz raise good points about what the rules actually say and what that means for writers. With more and more people looking to the self-publishing route, I think it’s going to have to be seen as a more viable option by award committees. Like Kelly says, an author is choosing to share their work with the public by self-publishing, just as they would by going the traditional route. Not that I think this means Seraphina should be disqualified. As Liz notes, the rule regarding self-published books currently seems to treat them as separate entities than previously published books from a traditional publisher–which means that Hartman’s previously published graphic novel doesn’t count toward her Morris eligibility. And Seraphina is an awesome book, and I’m really excited about it being recognized for such a high-profile award. But I also wouldn’t be surprised if the situation were different in ten years. Again, I think as more people look at self-publishing as an option, I think the committee will have to wrestle further with how that affects eligibility and what constitutes a debut. If anything, I think this situation has started a really interesting conversation about the line between traditional and self-publishing with regard to awards, and how that line gets fuzzier every year.